Working out at home is a great way to build muscle and get fit. But with so many pieces of equipment available which ones should you get? One of the most practical options is a good cheap weight bench. This lets you train with dumbbells or heavier weights. More importantly, you’ll be able to lift safely knowing the bench will keep you well supported. With a good workout bench you can do a number of different exercises that will let you attain your fitness and bodybuilding goals. Here are out top picks for each type of weight bench. We’ve included different types of benches as well as those that come with barbell supports should you prefer going with a full set rather than just the bench. Do You Need a Weight Bench? Getting a weight bench is probably the third thing any beginner strength trainee looks at. They often begin with bodyweight training, then move on to dumbbells. When the dumbbells easier, it’s time to add more weight. Here’s where weight benches come in. Weight benches allow you to use heavier weights via barbells. While it’s true that you can use barbells without a bench, having one allows you do more exercises, including the all-important bench press and incline presses. The simplest form of weight bench consists of just the bench. The bench is often used with a power rack or barbell rack. Many people also use plain benches for dumbbell exercises. If you want to be able to train your legs as well, getting a bench with a leg apparatus goes a long way. This allows you to do leg curls and leg extensions, both of which help built your hamstrings and quads, respectively. Finally, there are weight benches that come with a lat pulldown attachment as well. Having this allows you to work on your back muscles including your middle back and lats. Overall, the weight bench is an essential piece of equipment for any home gym. It is one of the basic items that most bodybuilders start with. Flat bench: one of the most versatile pieces of gym equipment, these are often called utility benches because you can do a lot of things with them including dumbbell workouts, ab exercises or just sit on them between sets. Adjustable weight bench: a step up from the flat bench. These allow you to adjust the angle of the backrest. In doing so you add more exercises to your workouts. These benches allow you to set to backrest as high as upright 90 degrees, different angles of incline, flat and decline. Decline bench: fixed to slope downwards, this bench is designed to be used for core workouts. They are ideal for doing sit ups, and twisting exercises that involve the core. Full workout bench: probably the most useful among the group for the home gym this including not only the bench but also a stand setup to rack the barbell. These benches often include leg workout apparatus and sometimes a preacher curl attachment as well. With it you can do bench press and other barbell exercises that isn’t as easy to perform with the other benches listed above. In this section, we list down the different things to consider when buying a weight bench. 1. What Type of Bench Do You Need? Depending what you need the bench for, you may need one type of bench over another. We listed the different types of benches above along with their features. For us, the adjustable bench is a great place to start. It allows you to do flat, incline and decline presses. This gives you the benefit of 3 benches in 1 product. However, if you already have one type of bench, say a flat bench, then getting an incline or decline may be a better option depending on the type of workout you plan to do. 2. Do You Want a Plain Bench or Do You Need Leg Apparatus and/or Lat Pulldown? Once you’ve decided on the type of bench to get, it’s time to consider whether or not you want accessories to come with that bench. Weight benches with leg apparatus and a lat pulldown mechanism are great for beginners because it lets you cover all the major body parts with just one piece of equipment. But, if you already have a rack or prefer to work your legs and back via squats and pull ups, respectively, then saving the extra cash and going with just the bench without the accessories is a better option. 3. How Much Weight Do You Need? This is one of the most important factors to consider. Here, you want to consider the weight you’ll be lifting a few years from now. This allows you to use the bench for many years to come and not just for a few months. Also, make sure to include your body weight to the calculation. Most benches will give you the maximum weight in pounds including the lifter’s body weight. Finally, take into consideration the other exercises you’ll be doing on the bench. If you plan on using it for step ups or seated military presses, make sure to take the weights you’ll be using into account. Ideally, consider the heaviest weight used in all the exercises. Your bench should be able to support that amount. Most weight benches are priced according to their quality, which is directly associated with the thickness of the steel. This means the heavier the capacity, the more expensive the bench, and the heavier the bench will be. If you do go with an adjustable bench, make sure to check how many incline and decline settings there are in each product. You’ll be surprised at the variations available. Some have as little as 2 or 3 levels. Others go as high as 6 settings. Additionally, look at what degree of inclines and declines are available. While there are popular angles like 30 and 45 degrees, different manufacturers offer different angles of incline and decline. So, make sure to check. In general, the more settings there are the more specific you can be with targeting the upper and lower pec muscles. Weight benches vary in size as well. Some are longer, others are wider. In general, cheap weight benches are shorter and narrower. That’s because they use less material to keep the costs down. If you’re a tall lifter, you’ll want a longer bench. If you’re a massive guy, then a wider bench will let you lift better because the entire width of your back is supported. Additionally, the height of the benches also differ. Many are close to knee high. But some are lower which may not suit some lifters. Finally, depending on how much space your home gym has, you may want to opt for compact or portable weight benches. These are smaller, shorter options that save on space. Weight benches vary significantly with cost. The thicker the steel (lower gauge), the higher the quality the bench. It also often means the workout bench is able to support more weight and is more durable. Their downside is cost. Cheap weight benches can go as low as $100 for a complete weight bench with accessories. An affordable plain bench can be as cheap as $50 as well. The goal with cost is to balance it with the weight capacity of the bench and your budget. Ideally, you want something strong enough to support your future lifts without breaking the bank. Best Cheap Flat Bench: The most inexpensive weight bench in our reviews, and rightfully so is this unit from Marcy. Very affordable, this gives you a good utility bench that you can use for various dumbbell exercises as well as ab workouts. It offers a weight capacity of 300 lbs. and is fitted with an all black look including the high density foam padded seat. It does have some red trimming for its logo but pretty much an all black design. This workout bench measures 43 inches long, is 14 inches thick and 17 inches tall. It does not offer any adjustability so you aren’t able to do any incline or decline exercises with it. At least not naturally. For those you’ll want to see the next type of benches below. The legs of this unit are made with 14 gauge steel tubing, being 1.25” by 2.25” wide. At the ends of each of the bench’s bases are rubber stoppers that offer grip to the ground so it doesn’t slide when you’re working out on it. Cheapest Adjustable Weight Bench: Offering more versatility that the flat bench this adjustable bench lets you adjust the back rest to 4 different positions including decline, flat, incline and upright. The variable settings on the angle of the back rest allows you to increase the number of exercises you can do with your bench. And for a few dollars more, we think it’s worth the small extra cost. The decline setting allows you to do decline presses as well as use it for ab exercises. The upright setting allows the backrest to stand at 90 degrees so you can rest against it while doing seated overhead presses. The inclined setting lets you do incline dumbbell presses to target your upper pectorals. And of course, it can also be set to flat for all the other seated exercises. This inexpensive workout bench also comes with 4 foam rollers that let you rest your ankles as well as the back of your knees when doing ab exercises. Additional handgrips give you something to hold on to when doing leg raises and other ab workouts. Best Cheap Adjustable Weight Bench: While it isn’t as cheap as the previous unit, this one is nevertheless still very affordable. It costs less than many of the other adjustable benches but offers a number of similar features. Offering an adjustable back rest as well as an adjustable seat, you get a total of 10 different positions you can set this unit to. The back rest can be switched between 7 different positions including flat and numerous inclined setting. The seat, meanwhile can be elevated as well to change the angle of your workouts. In total it allows you change between 3 positions. The bench also offers more in terms of weight capability. It is rated to hold 500 lbs. total when used as a flat bench, and as much as 400 lbs. when inclined. The higher weight limit allows you to use this for bench press exercises in combination with a power cage or a set of barbell racks. One final thing of note with this unit though, is that while it has a number of various incline settings, it does not offer a decline position. Cheap Decline Bench: To work on your core muscles including your abs and obliques, this decline bench allows you to invert yourself partially in position for sit ups and ab twist exercises. This is a fixed, single unit bench which means that it serves one purpose, for decline exercises which are mainly core related. It measures 45 inches long and 17 inches wide. From the floor up to its peak point it measures 25 inches high. This workout device also offers a 200 lb. user weight limit. This decline bench has a gray design of different shades plus the red branding logo. It offers 2 different positions to place your legs and 2 pairs of thick foam padded rollers to make it comfortable to rest your legs against them for leverage when doing your core exercises. Cheap Weight Bench with Barbell Racks: Our reviews have graduated from the flat utility bench and we’re now with the full weight bench. Among them many available, this is one of the best low cost workout benches you can get to get started on your home workout program. Offering a maximum weight capacity of 750 lbs. you can load the Olympic sized weight rack with up to 300 lbs. and the leg extension apparatus with as much as 150 lbs. of plates. A squat rack where you can adjust the height of the upright supports to fit your arm length. You can also increase its to maximum height when doing squats. A removable leg extension apparatus that lets you do leg curls and leg extensions or take it out when you want to use the entire bench. What’s even better is that the adjustable bench and the squat rack are not welded together. This allows you to use them together for doing your bench press exercises or separately. The bench can be used for different dumbbell exercises, while you can use the squat rack for squats to work on your lower body. Includes 100 lbs. of weights: Since we’re on the topic of cost, this full weight bench is not only one that’s ready for you to go and use but also also offers excellent value for money because it includes the bar and a good amount of weights with it. With almost all workout benches, you’ll need to supply your own weights, which means buying the bar and the plates. This one on the other hand offers both included. In total there is 100 lbs. of weight included. 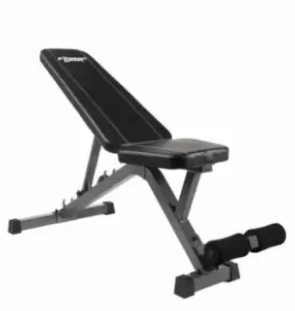 This set costs just about the same as the Body Champ Olympic Bench above and comes with 4 different back rest positions. The unit also includes a leg extension apparatus so you can work on your lower body.